The fact that the original Mercedes SLK was on sale for fully eight years without significant alterations gives some clue as to how advanced it was when it came to market back in 1996. The 21st century was a problem the SLK was starting to find very hard to come to terms with and by 2004, the car felt rather off the pace. Cue the latest generation SLK, a car that takes a giant leap forward in terms of quality, driver involvement and all-round sophistication. Mercedes had built its reputation on delivering cars that needed no excuses. The SLK showed the German giant was back on form. Used examples are starting to appear in meaningful numbers and despite solid residuals, they're well worth tracking down. 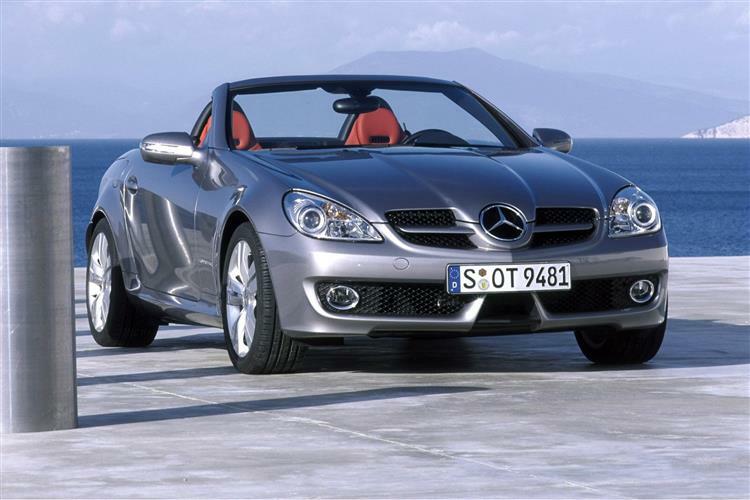 Mercedes launched the second generation SLK with two models. The value pick was the supercharged SLK200K which made a very assured entry-level proposition, originally priced as it was at £29,032. 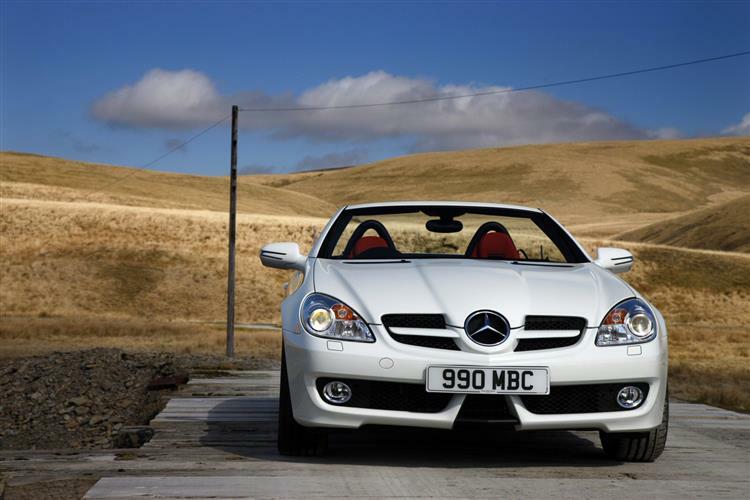 Pitched for a while at the head of the line up was the SLK350, which originally carried a £37,602 sticker price. This would probably have sufficed for many manufacturers but Mercedes were keen to further flesh out the SLK range and the next addition launched was the rocket ship SLK55 AMG, a car that debuted in October 2004, offering a power proposition that Porsche couldn't match. 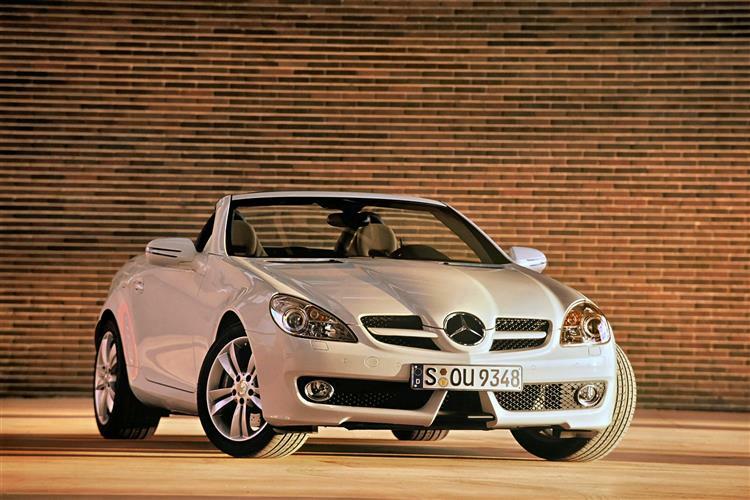 A mid-range model, the SLK280 was quietly slipped into the SLK portfolio in September 2005. The basic shape of the SLK was left unchanged with the MK2 changes, the characteristic short boot and long bonnet creating a more aesthetically pleasing profile than most of the other hard top convertibles, many of which have rather odd proportions. It's a bigger car than it predecessor, the body being 72mm longer and 65mm wider, which means more space inside for beefier occupants. The roof mechanism has been widely copied and now no longer amazes bystanders but folds neatly into the boot in 22 seconds. The swivelling rear window means that with the roof folded there's now a good deal more space available in the boot - a notable issue with the old car. The SLK is a car that's associated with engineering novelty and Mercedes didn't disappoint with this version. The AIRSCARF neck-level heating system delivers a warm flow of air from the headrests, enabling SLK owners to drop the roof without experiencing the chill fingers of the typical British climate. This system monitors road speed and temperature and adapts the fan speed accordingly to ensure a toasty 'scarf' of hot air. Safety provision was well and truly revisited too, the MK2 SLK featuring a 40 per cent increase in the use of high tensile steel alloys. For the first time in an SLK, Mercedes used adaptive airbags which deploy in two stages according to the severity of the accident. Twin stage seat belt load limiters also feature and head/thorax airbags respond to side impacts. A sensor triggers the side airbags and both belt tensioners during a vehicle rollover, with solid roll-over bars behind the seats also helping to prevent injury in the unlikely event of such an accident. The styling is a good deal more aggressive in its detailing than the cute first generation car. The distinctive arrow-like tapering of the front bonnet is reminiscent of both the McLaren Formula One racer and the Mercedes SLR McLaren supercar. Twin exhausts, a deep front spoiler and purposefully blistered wheel arches give the SLK a welcome dose of attitude, beefed up by the SLK55 AMG which features additional vents in the front spoiler and bigger alloy wheels. Cars like the BMW Z4, the Audi TT Roadster, the Porsche Boxster and the Honda S2000 forced the SLK to up its game. Despite the MK1 model selling over 308,000 examples worldwide, the market moved on and more dynamic and purposeful designs were required. The second generation car fulfils that particular brief very well and Mercedes even resisted the temptation to hike prices unreasonably. Many will be tempted to give manual cars a wide berth but the good news is that the manual gearbox fitted to the SLK is a very good unit - a rarity for a Merc. This perception means that there's a relatively big premium for the automatic versions and keen drivers will be able to source competitively priced manuals if they're on the ball. Very little goes wrong with the SLK. The roof mechanism always was one of the better designed folding tin top systems and this time round it's even more rugged. The quality of the interiors is also a good deal better than the old SLK. Check alloys for signs of kerbing and make sure the service stamps are up to date and that the alarm and immobiliser are functioning properly. (approx based on an SLK200 inc Vat) A front exhaust (including catalyst) is about £625 with the centre/rear section about £275. A headlamp is about £225 and an air filter is about £11. Front shock absorbers work out at around £135 and an oil filter around £10. All four engines used in the MK2 version were originally new to the SLK. First up is the 1.8-litre TWINPULSE engine that has seen service in the C-Class line up. Supercharged to produce a respectable 163bhp in the SLK200, this powerplant offers the dual benefits of higher performance and lower fuel consumption. The smaller engine offers lower friction losses and better thermodynamic efficiency, whilst the Kompressor Eaton-style supercharger has been designed with better engineering tolerances and advanced rotor coatings. Crankshaft driven, this supercharger allows the engine to run with wider throttle openings, again improving efficiency. A cylinder head with variable valve timing and double adjustable overhead camshafts are also refinements that were ushered in with the Twinpulse engine. Smoothness is a given due to two contra-rotating Lanchester balancer shafts, and engine weight has been decreased by 10% through the use of aluminium on items like the crankcase. A fuel economy figure of 32.7mpg pays testament to this efficiency. Mercedes' six-speed manual gearbox should fill the initiated with anticipation, promising as it does a short, fast shift. 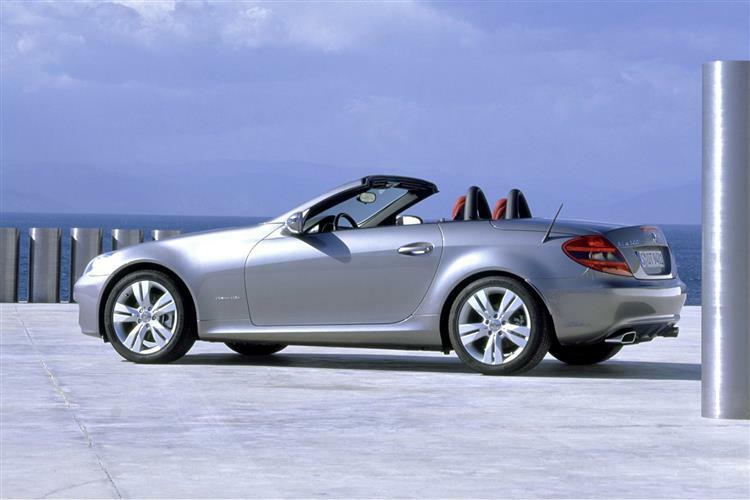 Take one more step up the ladder and you'll reach the SLK280 with its 231bhp V6 engine. It will reach 60mph in 6.5s and return 29mpg on the combined cycle. Next up is the SLK350, powered by a 272bhp V6. Seriously rapid, the SLK350 will rocket to 60mph in 5.4 seconds and even when fitted with the new '7-GTRONIC' automatic gearbox, it'll still stop the watch at 5.5 seconds for the sprint. With variable camshaft control on both intake and exhaust sides of the engine - a first for Mercedes - this engine offers a lot of grunt for its relatively modest size. Despite this, it'll still average 28.7mpg - a full five per cent more fuel efficient than its SLK320 predecessor. If you're after real tarmac-tearing torque and power, there's always the SLK55 AMG. The first eight cylinder SLK, it offers a heady 360bhp and 510Nm of torque, making it virtually as muscular than a BMW M5. Electronically limited to a top speed of 155mph, the SLK55 AMG will nevertheless imperiously destroy the sprint to 60mph in 4.7 seconds, power being deployed by the 7G-TRONIC automatic gearbox. 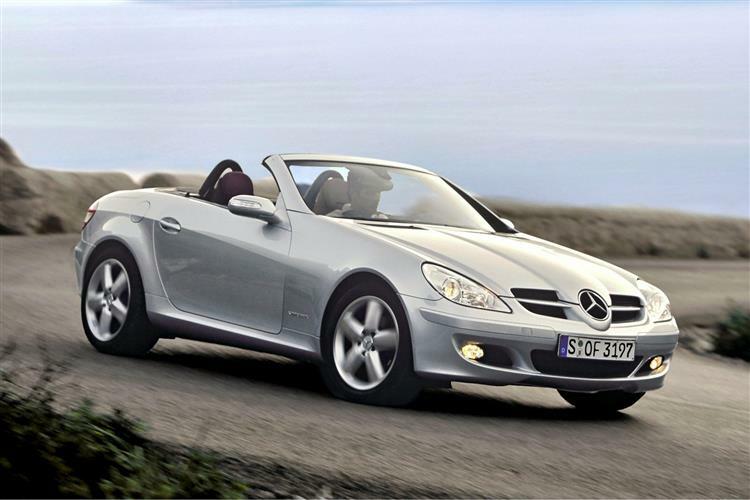 The SLK is one of the standout models in a revitalised Mercedes range. Decent used examples are fiercely fought over, so sharpen your elbows and dive in. 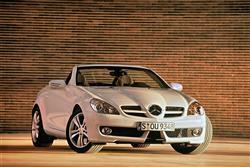 The pick of the bunch at the moment looks to be an early SLK350 but there isn't a bad model in the entire range.